Size of this preview: 800 × 593 pixels. Other resolutions: 320 × 237 pixels | 640 × 474 pixels | 1,024 × 759 pixels | 1,280 × 949 pixels | 4,021 × 2,980 pixels. 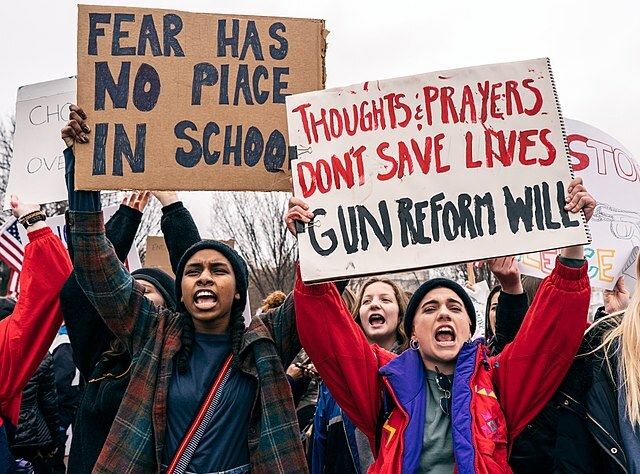 English: The demonstration was organized by Teens For Gun Reform, an organization created by students in the Washington DC area, in the wake ofthe February 14 shooting at Marjory Stoneman Douglas High School in Parkland, Florida. This image was originally posted to Flickr by Lorie Shaull at https://flickr.com/photos/11020019@N04/40369207261. It was reviewed on 21 February 2018 by FlickreviewR 2 and was confirmed to be licensed under the terms of the cc-by-sa-2.0. current 04:44, 21 February 2018 4,021 × 2,980 (6.77 MB) Animalparty (talk | contribs) File:Thoughts and Prayers Don't Save Lives, student lie-in at the White House to protest gun laws (40369207261).jpg cropped 30 % horizontally and 22 % vertically using CropTool with lossless mode.